I wanted to write an article for the blog before Kyle (Editor’s Note: Kyle is the President/Big Dog here at APS) busts me down to fulfillment or worse, he tells me to hit the bricks. You see the problem is… I have an addiction. Once the leaves start turning and that first chilly day arrives, I start thinking about my addiction. For the next several months I am glued to weather.com looking for low temps and nlmoc.navy.mil willing the sea surface temps to drop. My addiction is very serious; it has affected my relationships with others, cost me hundreds of dollars, countless hours, and has even caused me to miss work on occasion. Hello, my name is Aaron and I’m addicted to iceboating. My home club, The North Shrewsbury Ice Boat and Yacht Club in Red Bank, NJ, has been blessed with a beautiful 5-6” plate of salt water ice covered by, “balls hard” frozen freshwater on top. As a result, I have been giving the old Jetta a workout on my now weekly pilgrimage to New Jersey to sail on my DN. 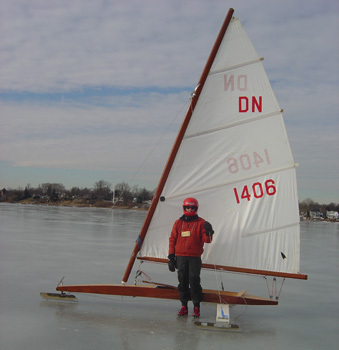 If you have never sailed on an Iceboat, don’t. You may lose your job, your spouse and all respect for the softwater sailing that you enjoy so much. You will never again look at the instruments on the mast when they read 10.2 knots and think to yourself “Yeah… we’re really gettin’ some now”. There will be other difficulties involved too. First, you will have to stifle your yawn as the relatively super expensive boat that you PHRF race slowly accelerates up to walking speed under full canvas. Oh, and you’ll have to get used to not sailing with a crew large enough to fill two big booths at Chili’s. Another thing that might be tough for the softwater bigboat guys is the DN only has one sail and it is only a 60 square ft piece of Dacron — so you might have to tell your local sailmaker to ummm… you know. 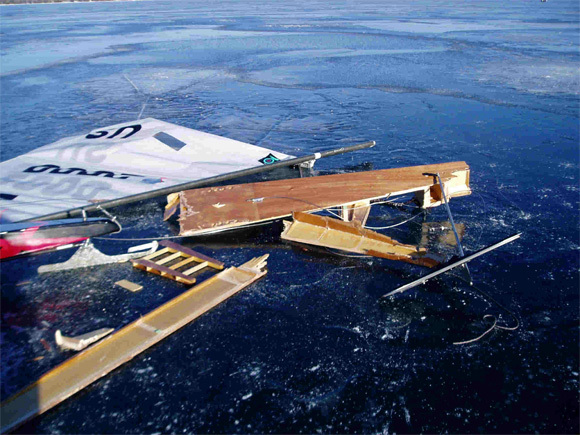 If you do find yourself on an iceboat, ripping across a piece of ice at 40+ mph try not to scream like a little girl (or James when our Patagonia preseason order arrives). 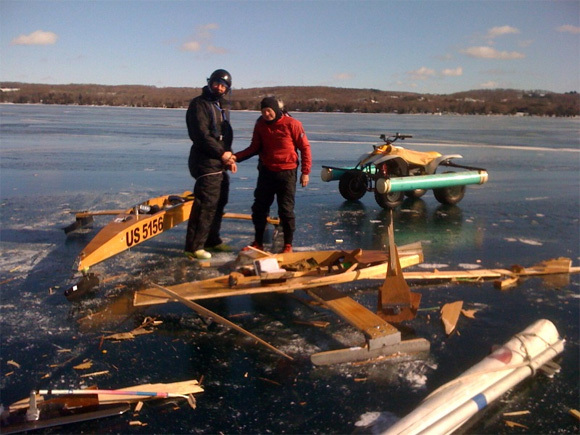 Remember that work is there all year long, but iceboating only happens several weeks a year, if at all. 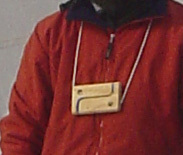 So I’m officially encouraging you to beg, borrow or steal an iceboat and get on the ice. There is still plenty of ice in the Midwest and the DN Worlds will be somewhere in the eastern United States from February 8th – 13th. If any of you blog readers want to see a show, the World’s might be in Bellport, Long Island – lets hope it is in Long Island and the current snow doesn’t mess up the reported 3-mile sheet of ice. Note: The DN Worlds actually ended up in Torch Lake, Michigan, much to the dismay of Aaron who couldn’t make the trip up there. Welcome in the club of DN bloggers, but please take these carnage pics away. There are way too many buerocrats who want to stick their heads into our beautiful sport. I know what I am talking about. Had such an accident 14 days ago. Glad nobody got hurt badly. Got on a DN Ice Boat for the first time a couple of weeks ago on the Toms River in New Jersey and everything Aaron says is absolutely true. Fast just doesn’t quite describe the rush one gets when 6 inches off the ice laying on your back going 40+. Probably going to have to buy one even though I might only get to use it 2 weeks every couple of years. Look at A-Ron, famous blogger!!! I share his obsession as well; mooch rides at every opportunity. Wish I knew there was another DN’r here in Annapolis. I have 2 and the guy I work for has another. We sailed on Bush River (1hr from Annapolis)2wks ago. I’ll stop into APS and inroduce myself.